As we neared the Ticuna indigenous village of Nova Itália, Antônio my Ticuna guide told me that at low water during the summer months, we could have walked across here. “There’s a path 7 meters below us,” he said, matter-of-factly. I was swimming the 1.5km-wide, deeply flooded, black piranha-infested Igarapé Amaturá, in a torrential rain storm. I could see about 25-30 indigenous Ticuna people watching us from the bank, and by the time Antonio and I reached the shore there were at least 70 villagers staring at us – most of them at me, I guess. We folded up the pack rafts Antonio had used to transport the backpacks, and climbed to the top of the slippery clay bank, where we were surrounded by all these people. Antonio asked them in Ticuna language if we could speak to the Cacique (chief) of the village, and we were then escorted to a house through the crowded rain-soaked muddy street. It seemed like the whole village had come to see what was happening, and it was impossible to see where we were going as there were so many people surrounding us. I was a feeling slightly uneasy, as many of them understandably had concerned expressions on their faces. We entered the house of the Chief, while outside, despite the rain, many people continued to gather, cramming the doorway and windows, curious to see what the gringo and his Ticuna accomplice were doing here. We decided to return to Amaturá and look for the Cacique, so I hired a canoe to go back. Amazingly enough, and to cut a long story short, we found the Cacique and I was able to speak with him. So the following morning, I had to return to the Nova Itália community for a meeting with all the Ticuna chiefs, the vereador (councillor) and other senior village members, in the large community hall. 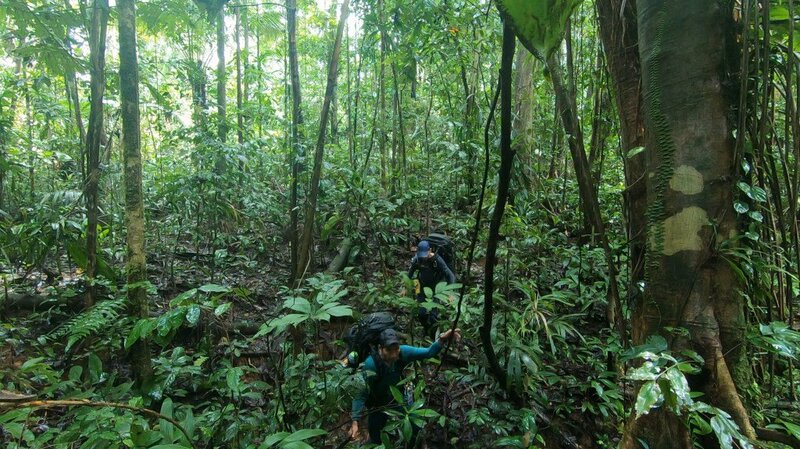 Antonio had decided to cut and run, returning to his own village and leaving me to face a hundred or more of the local residents and an official from Amaturá, the chief, and other important members of the aldeia (village). I stood nervously in front of them and explained my mission in Portuguese, and the vereador translated into Ticuna Language for the other people. It was uncomfortable for me, but after a few hours of chatting and showing them maps, they seemed to understood my mission. Fortunately I was granted permission to pass all Ticuna land and communities that lay ahead, but I was to ask to speak to the chief of each village first. “I will send a photo of you and information about you and your mission to all of them in advance,” said the Cacique. “Muito obrigado,” I said, as we shook hands. I returned to Amaturá again with two members of the village, and bought gifts for the community: six chickens, five kilos of rice, 12 large bottles of fizzy drinks, and about three kilos of sweets. Now, two weeks on and i am currently still waiting for my guide to return from his village. Unfortunately they don’t have mobile reception there, and I have a sneaking suspicion he doesn’t want to go any further even though I already paid him a week in advance. I have already tried to find another Ticuna guide, I returned to the large Nova Itália, village for a third time, the chief put out a request over the village tannoy so all the people would hear, we felt sure i would find someone willing to cross to the border of Peru with me. An hour later he returned to the house and said “Im very sorry but it seems nobody wants to walk with you,” “why do you think that is” i politely asked, are they afraid of entering the jungle’? “No” he said “the Ticuna communities have a football tournament over the next month and they also don’t want to miss seeing the world cup football tournament on television, but somebody will go with you after it has ended.” okay, i thought, i need to think of a plan B. The native language of Ticuna is unique and spoken by appropriately 40,000 people in Brazil, Peru and Colombia. It is a tonal language with 5 tones after different pitches. The tones are not always indicated in writing, and below is an example of their written language. I thought this was an appropriate text in view of the past and more recent history of at times brutal slavery the indigenous suffered following colonialism and the arrival of the conquistadors who considered themselves to be of a superior race. FUNAI has provided textbooks to teach the Ticuna language to children so they can retain their original language as well as speak Portuguese or Spanish. The Ticuna (also spelled Tukuna or Tikuna), live in the Amazon rainforest near the borders of Peru, Brazil and Colombia along the Rio Solimões. They were one of the first major tribes of the Amazon to be contacted by the early conquistadors. Even with over 400 years of contact, the Ticuna people have managed to preserve their personal identity through their native language, traditional religions, rituals, and cultural art forms. They have survived the constant threat of violent extermination and forced integration policies by Western society. There are over 70 established Ticuna aldeias (villages) in the Alto Solimões. With a population of over 36,000 within the Brazilian Amazon, an additional 6,000 in Colombia and another 7,000 in Peru, the Ticuna are the most numerous tribes in the general area. They are also one of the last remaining large population groups of indigenous people in Brazil. Much of the Ticuna population resides along a 600 mile stretch of the Amazon. Within the villages, most Ticuna live in malocas, large hut-like dwellings that have a mythological significance among the indigenous people. Like many other indigenous people’s, the Ticuna have suffered their fair share of violence and displacement in recent times. Constant encroachment of their lands by loggers, rubber-tappers and fishermen has resulted in a number of violent conflicts, so it is understandable that they are suspicious of the motives of other people entering or passing their territory. Read more comprehensive information about the Ticuna people here. 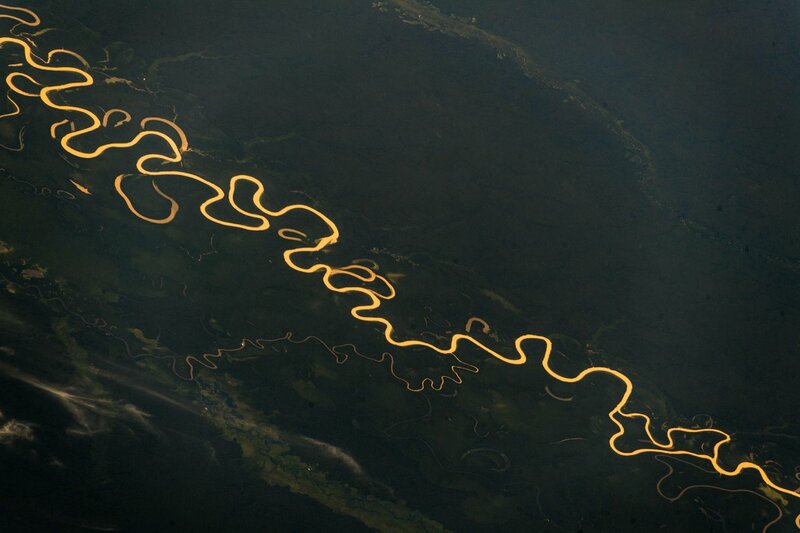 The Amazon, by far the biggest and mightiest river on the Earth. is now even bigger, having reached its annual peak. 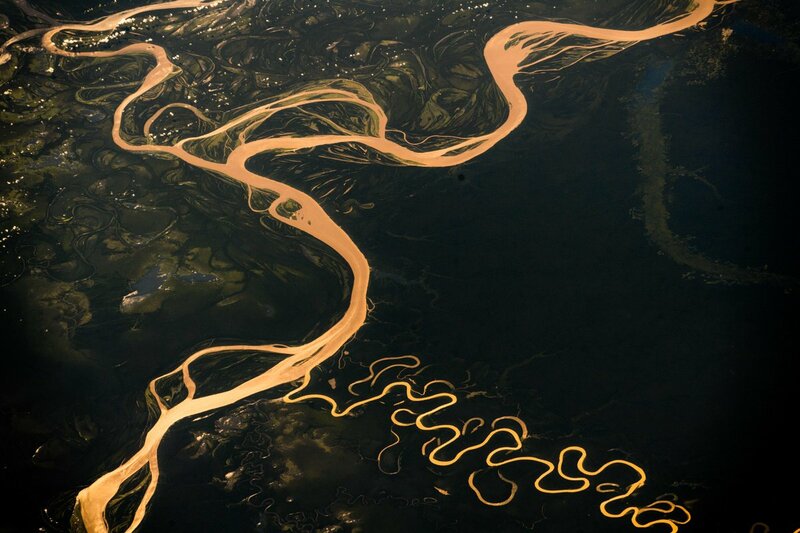 I need to find my way across the flooded Rio Jandiatuba to Benjamin Constant. With all the worries and frustrations about money, guides, visas, insurance, my health, the potential dangers that lie ahead in Peru, and the ever-lengthening duration of this journey, over the last few weeks my thoughts and emotions have been turbulent and overflowing, similar to the waters of the Amazon basin in full flood, they have been, up to the brim. Header Photo: A painting on the wall of the little guest house in Amatura. Many houses, restaurants & hotels in Amazonas have large original hand paintings on the walls. 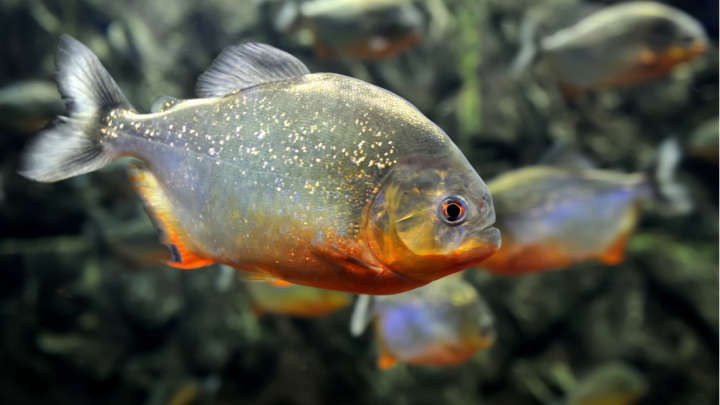 Ticunare Pirarucu Jaraqui Pacu Tambaqui: These are some of the most common and popular fish found in the rivers and flooded forests of the Amazonas. A tracking map will be published with the next blog, as i haven’t moved very far since the previous blog post! Thanks Luke, No plan to give up!! I have some new gear waiting in Iquitos including 2 new desperately needed hammocks and two backpacks. I plan send guide to collect them when I arrive in Tabatinga. But cheers for offering to help out. It’s incredibly risky and expensive to import stuff to South America! I agree with the above, please keep going and if need be tell us what you are in most need of. I feel you have got so far and if you can get through this next 500 miles then surely things will physically get easier. Are you going to stop and wait for the waters to go down a bit.? Apart from the obvious worries about lack of sponsorship, finding Ticuna Indigenous guides is the main current issue. It’s to dangerous to go it alone, but I have been tempted to do so. I have now, after searching other communities secured two Ticuna brothers to hopefully start within the next week. They are vital to help me get me passed other areas occupied by Ticuna tribes without too many problems. No plans to wait for waters to go down as I have planned a route that should bypass major flooded areas. Just have one or two long river swims to reach high ground plus some flooded forest to traverse. I am passed the lowest point of the Amazon Basin now. I plan to do a sponsor pitch once i finally get into Peru, but I will get to the finish one way or another!